It’s finally here…barbecue season! Grilled chicken, ribs, and marinated veggies are on the menu all summer long. One of my favorite flavors is sweet and savory barbecue sauce, grilled to sticky perfection on just about any kind of meat. Why not make your own homemade BBQ sauce and avoid the corn syrup and unnatural additives that most sauce contains? It’s not hard to make, and you can freeze it or can it for later…making it as convenient as it is tasty. Start with two cans of organic tomato sauce, organic onions and garlic, honey, molasses, organic evaporated cane juice, apple cider vinegar and a little coconut oil. Chili powder and smoked paprika add to the flavor, and you can mix in as much (or little) red pepper as you’d like to give it a little kick. This recipe makes a large batch of sauce (2 quarts), so you can cut it in half if you’d like. Or, make the whole batch and can a few pints or put it in the freezer for later! To make the sauce, dice two organic onions and saute them with a few cloves of garlic and a little coconut oil until the onions are soft and transparent. Then, stir in the tomato sauce, the sweeteners, vinegar and the spices. The trick is to let the sauce simmer for a long time…this will reduce the sauce and allow it to thicken as well as bring out the best of the flavors. I let my sauce simmer for at least an hour, stirring it frequently to prevent it from sticking to the pan. Once it’s ready, you can decide if you want to keep it a little chunky or smooth it out by pureeing the onion bits. If you’d like it smooth, allow it to cool for a little while and then run it through a blender or food processor until it’s the consistency you’d like. I like to puree it, so that it brushes onto food a little easier! To can it (which makes it easy to grab a jar from the pantry shelf at a moment’s notice), you need to reheat the sauce to a boil and allow it to simmer for 30 minutes. Then, ladle the sauce into 4 pint jars (leaving 1/2 inch headspace). Clean the rims, and fit with hot lids and rings. Process jars for 20 minutes (adjust for altitude). Remove and allow to cool. To freeze, just put the sauce into airtight, freezer safe containers and place it in the freezer. There you have it! Savory-sweet BBQ sauce, all natural and ready to grill. Three cheers for Summer! Looking for a new BBQ sauce? 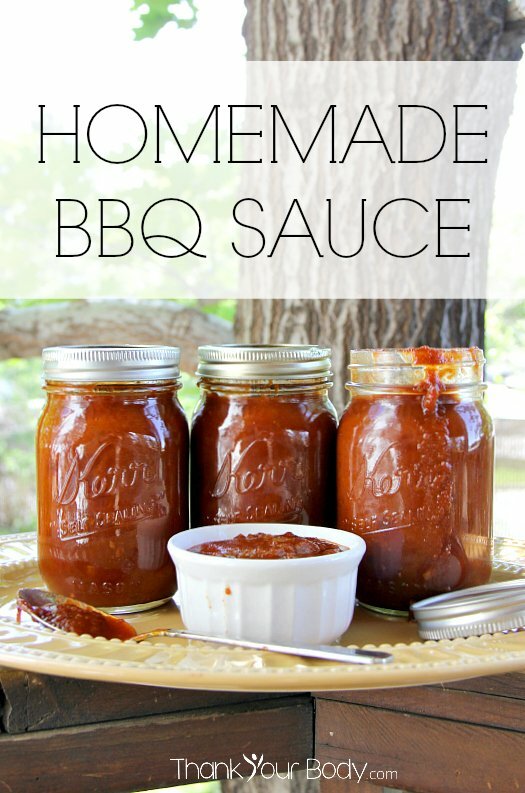 You can't go wrong with this homemade BBQ sauce that's perfect for all your grilling needs and more. In a large pan, saute the diced onion and garlic with the coconut oil until the onions are soft and transparent. Add the remaining ingredients, stir well and bring to a boil. Reduce heat, and simmer the sauce for at least an hour. If you'd like the sauce smooth, allow it to cool enough to handle and then run it through a blender or food processor until the desired consistency is reached. To can the sauce, bring it back to a boil and allow it to simmer for 30 minutes. Ladle into 4 hot, sterile pint jars, leaving ½ inch headroom. Fit with hot, sterile rings and process in a hot water canner for 20 minutes. Allow to cool and test lids. To freeze, allow the sauce to cool and then ladle into airtight freezer containers. Freeze the sauce, and take it out in advance to allow it to thaw.